It’s called a “murmuration” – and it’s one of the true natural wonders of the world. As they gather in the evenings to roost, starlings (or sturnus vulgaris as they are known scientifically) form a cloud that shape-shifts in the sky as the birds dance and whirl in unison. These synchronised aerodynamics are one of nature’s most extraordinary sights (and far more impressive in real life than on a screen). So why do starlings group together like this and form these spectacular aerial displays? One of the best places to witness this aerial ballet is Rome, where it has occurred nightly – generally between November and December – every year since the winter of 1925-26. About half an hour before sunset, anywhere from around a million to five million starlings take to the skies in this incredible pre-roosting performance. 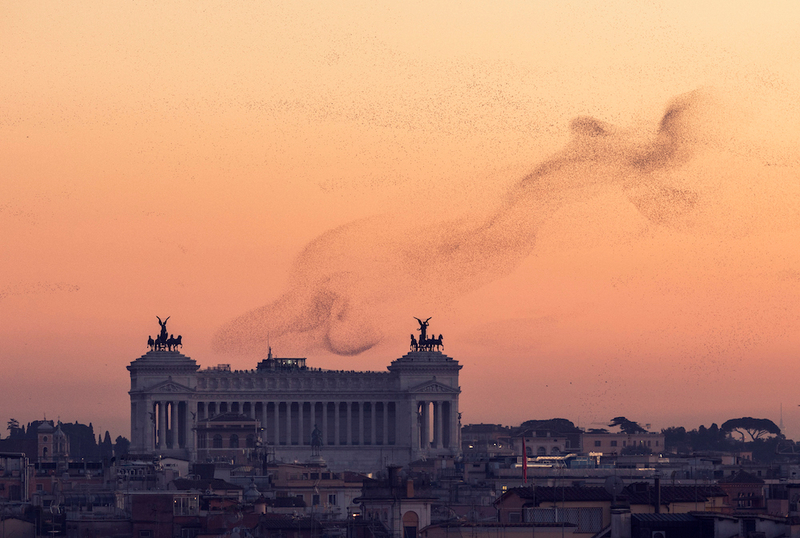 The stormi di storni (“flocks of starlings”) do just that – storm the skies above the Eternal City… but only after eating for Italy. According to Wanted in Rome, the number of starlings spending winter in the capital has increased dramatically in recent decades, and some studies claim that the birds consume up to five per cent of Italy’s entire olive production! And, of course, that many birds congregating in one area can only mean one thing: a whole lot of bird poop. Perhaps this is why “murmuration” is only one of the collective nouns for starlings – a group is also called a “scourge” and a “vulgarity”. But it doesn’t alter the fact that the sight of millions of birds swooping and whirling as one in the sky above Rome is an unforgettable sight. So look up, gaze and marvel… just don’t forget your umbrella.